Bacon, cheese, tomatoes, pasta – what a genuine combination of flavors. Four everyday items that most people already have in their pantry, that is what makes this dish easy. What makes it special is how those flavors come together in a sophisticated way, elevating an unpretentious dish to something special. 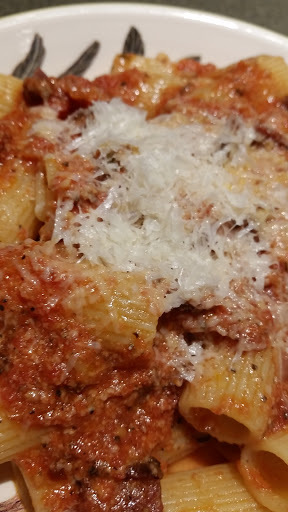 Rigatoni All’Amatriciana holds a special place in our home. In 2012, we embarked on a great vacation trip to Rome. 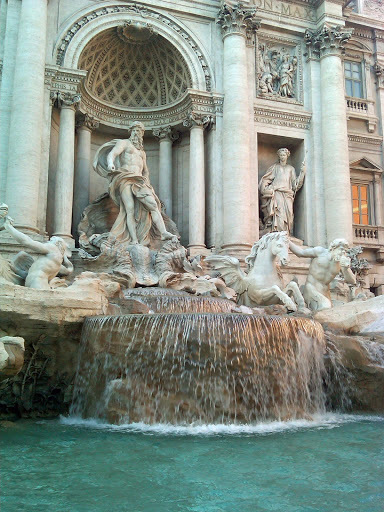 We booked a great apartment near the Spanish Steps and Trevi Fountain. After a long day/night of travel, we were ready to have an early dinner and call it a night. We popped into one of the many very busy tourist restaurants near the fountain and perused the menu. Our son, Ben, immediately spied what he wanted. “There is pasta with bacon, dad!” Over the next eight days of our wonderful trip, we discovered that Pasta All’Amatriciana was a very common dish in Roma. We ordered it several times just to see how each place made the dish. We learned that their execution of this simple dish was very telling about the quality of other food on the menu and the skill of the chef. Upon our return home, I was determined to make this dish mine. 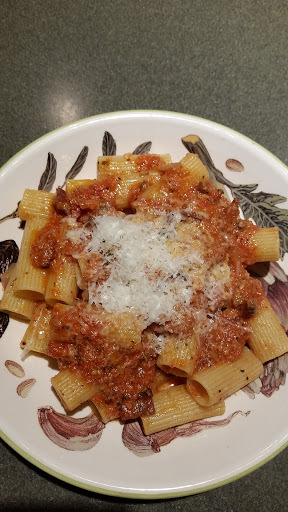 I already had all of the ingredients on hand: peppered Guanciale (cured jowl bacon), Rigatoni, Pecorino Romano cheese, and home-canned San Marzano tomatoes. I experimented a bit, tweaked my process, and now have a dish that is a frequent family request for an easy weekend dinner. Typically, I make a double batch (meaning two pounds of pasta) because Ben likes to have the leftovers for his lunch that week. Ben makes this dish on his own, too. This recipe is a double batch. Start with about six ¼” slices of guanciale. 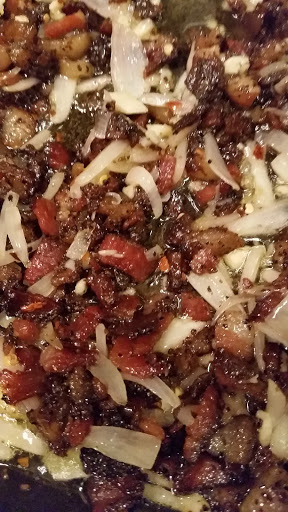 If you cannot find it locally, you can order from Edwards on line or you may substitute pancetta or peppered slab bacon. Dice the guanciale into ¼” cubes. It should be about 1-1/2 to 2 cups of meat. Brown the cubes in a nonstick skillet over medium heat. Get them good and crispy. Make sure all the fat renders, or the finished dish will not be as good. When the cubes of bacon are well browned and the fat is all melted, remove the bacon cubes to a bowl with a slotted spoon. Pour off all of the pork fat into a heat proof bowl (I save the pork fat for browning potatoes or for searing osso buco prior to braising). If your meat was very peppery, wipe some of the residual pepper from the pan as well. Add a tablespoon of olive oil to the pan. 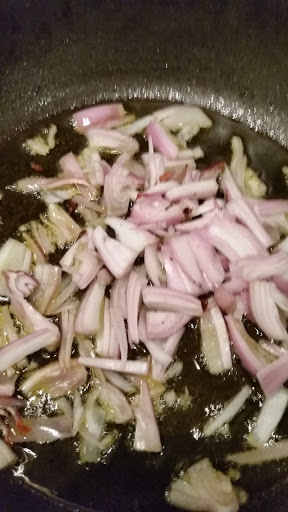 Sweat the shallot/onion and garlic over medium heat. Do not brown it. Add the crushed red pepper. Once all of this is ready, add the browned bacon back in. Add black pepper if your bacon was not already peppered. 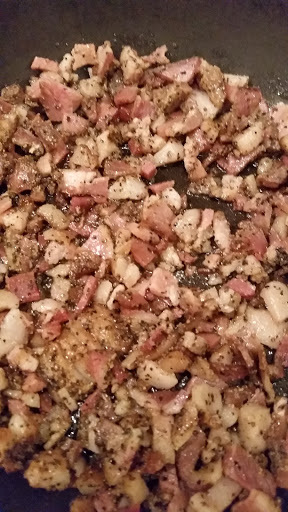 If your bacon was peppered, the dish will already have plenty of pepper flavor. I use my own home canned tomatoes. 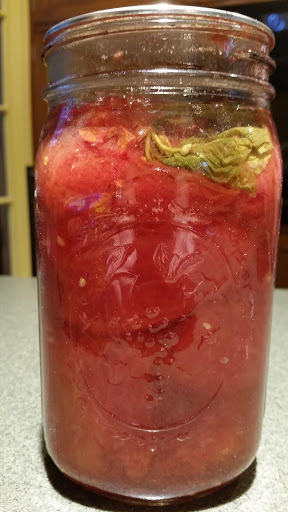 I always stick a basil top in each jar when I am canning them. This is because the best garden fresh basil is never available during the winter months when we use a lot of the canned tomatoes. 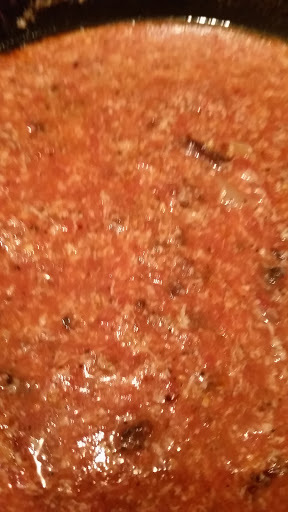 For this sauce, I just put my small stick blender right in the jar and give a few quick pulses to chop up the tomatoes and mix them with their juice. It also minces the basil in the top of the jar. Pour the crushed tomatoes into the pan. Once it comes to a simmer, lower the heat to Low and stir in the finely grated Pecorino. Allow the sauce to simmer on low. 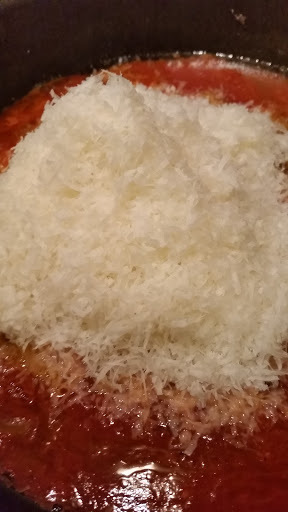 Stir to melt the cheese into the sauce. Cook the Rigatoni in salted water. I love De Cecco brand pasta. Do not overcook as the pasta will cook a little with some sauce after it’s drained. My pot takes about a minute to come back to a boil after the pasta is added, so I start timing then and go about 12 minutes until the pasta is just a tad under al dente. Drain the pasta and place it back into the cooking pot. Ladle about a cup of the sauce over the pasta and stir with a wooden spoon to coat. To serve, place a serving of pasta into a warmed bowl for each person. 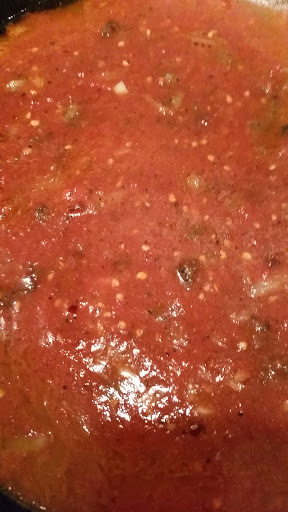 Ladle about 4-6 ounces more sauce over each bowl of pasta and top with more cheese! Buon Appetito!